Let’s face it, repairing damaged or decayed teeth is not what most folks call fun. Discomfort is often the case and at times it can be painful. To help you feel comfortable during your dental appointment, we offer sedation dentistry treatment at our Elkhart, IN, office. 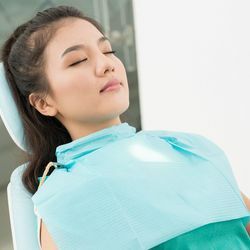 To learn more about how sedation dentistry is administered and how it can help you relax, contact Watkins Family Dentistry today. Aside from sedation and pain killers, there are several approaches we utilize to minimize and soften the pain. First, we believe in a gentle approach to dentistry. This is more than just kind words. Our staff are all trained to not only maintain a calm and soothing attitude but to pay close and genuine attention to a patient’s needs and concerns. It is also important that we proceed at a pace that is comfortable and appropriate. Second, the environment of the workspace and overall office is critical to creating a safe and non-threatening space. Elements such as harsh lighting, clutter, dental tools, excessive noise and so forth put a patient on edge and make it difficult to relax. Third, often the stress and worry is greatly magnified by not knowing what is going on or what to expect. The fear of the unknown and the unexpected is a major factor in making a dental experience unpleasant. It is of utmost importance to us that you understand why a procedure is being done, what is being done and that we keep you as informed as possible of what to expect during the procedures. By adopting this gentle and informative approach, working with you as a team member we are have had great success is getting our patients through dental procedures and reducing the stress and fear that many people often associate with dentistry. We also understand and accommodate the needs of patients who are particularly apprehensive or fearful of dental treatment. One very effective approach in these cases is to prescribe an oral medication to be taken one hour before your appointment. This medication relaxes, eases anxiety, and provides a comfortable, even pleasant dental experience. This is just one of a number of pain reduction approaches that we can utilize. We are very happy to discuss this with you and if this is an area of concern, please talk with us-we know just how important this issue is to you and to many of our patients. Nitrous oxide (laughing gas) combined with sedation medication helps to relax and put your fears at ease. Contact Watkins Family Dentistry today to schedule your appointment. We will do all that we can to ensure you are comfortable and happy during your dental exam and any treatment you require.